This is a significant point in time for real estate. We’re coming out of four years of tough times, but the market is once again on the move. There are lots of opportunities out there and it’s an exciting time to be a buyer, seller or an agent. In this edition of Property Insight, I’m going to discuss what it means generally when a property market begins to climb out of a slump. Real estate is a long term investment. When analysing a market, it is important to look at the long term trend. The average number of house sales over the past 20 years has seen around 6640 properties sold per year in Tasmania. Over the last four years, however, average sales have sat at just 5627 properties per year. When you look at movements in the market over time, you can see that it rises and falls in peaks and troughs. In 2015 there were 6682 properties sold, signalling the beginning of a rise in the market. It is likely that total transfers in the market will continue to increase and so too will prices. What does this mean for buyers and sellers? My mantra has always been that there is never a bad time to buy, as long as you are prepared to hold on to the property until it is a good time to sell. As a rule of thumb, it takes around 10 years to see a solid return. But, for buyers, a rising market is the ultimate time to buy. Buying on the way out of a trough means you can ride the prices into the peak and make huge capital growth. Buying now will result in the most significant capital growth in the next ten-year period.Sellers that have had property for sale through the trough that couldn’t sell, and withdrew from the market, will now find plenty of buyers ready to inspect their properties. The increased demand from multiple buyers means that you are likely to find a buyer willing to pay your price.If you are looking to upgrade your home, from say a $300,000 home to a $500,000 home, move now. You might think you should hold onto your current property to achieve a better sale price, but the property that you want to buy will also increase in value over time. For example, if prices rise 5%, your $300,000 will increase in value by $15,000. The same 5% rise on a $500,000 home will increase its value by $25,000. If you wait for prices to rise to sell your property, and buy the other, it will cost you $10,000.Investors holding property should keep holding on to it, if they can afford to. If you want to access the equity in the investment property, talk to your bank about re-drawing or borrowing against the equity. That way you can still hold on to the investment and gain the benefit of the capital growth that is just around the corner.The ultimate would be to borrow against the equity in your existing property to purchase a new investment property and achieve a great capital gain on both.Those considering moving out of the share market and into a more predictable investment, will find this a rewarding time to invest in property. Everyone’s situation is unique. If you would like to discuss your real estate objectives, I look forward to the opportunity to help you make informed decisions. Eight things every buyer and seller must know before making or accepting an offer.One of the most important things to understand as a buyer or a seller of real estate is what goes in an offer. An offer is a buyers official proposal to a seller. It includes all the buyers terms around how they wish to buy the property. These terms must be met before the sale becomes official. The seller can reject or negotiate alternative terms before accepting an offer. Here are some of the most important things to understand before making or accepting an offer. 1) Cash versus subject to finance Subject to finance is one of the most common clauses (terms) in real estate contracts. This means that a buyer would like to buy the property for a certain price, subject to a bank or other financial institution lending them the money. There is always a set time frame, usually around fourteen days. Cash contracts mean that the buyer is committed to paying the agreed price for the property. They have the funds readily available, either as a pre-approved loan or in their own accounts. Cash contracts are much more appealing to a seller because the finance cannot fall through, causing the contract to become void. A seller presented with two offers may select a cash offer even if it is for a lower price because they are motivated to sell within a certain timeframe. If you are looking to buy, get your finance pre-approved by your lending institution, you will be in a much stronger position when you make an offer. 2) Building inspections Another common clause is the building inspection. Subject to a building inspection means that the sale will only go through if the property is found to be structurally sound by a building inspector. It is important to understand here that minor defects like a rotten window frame or leaky downpipe will not stop a contract going through as these are not ‘structural’ defects. Like the subject to finance clause, buyers can request to have a building inspection done prior to making an offer. Again, this puts the buyer in a stronger position when making an offer by removing the need for this clause. 3) Subject to...There is an infinite list of things that can be placed in an offer as part of the terms of sale. Here are a couple of the common ones.Subject to sale: Means the buyer wants to purchase a property subject to the sale of their property. The funds will not be available until their contract officially settles. As a seller considering a subject to sale offer, it is a good idea to take a look at the other property first to see if it is likely to sell for the price they are asking. 4) Unconditional offersThis is what every seller wants to see in the hands of their agent. An unconditional offer means that there are no terms around the sale/purchase. The buyer has the finance and is satisfied with the property. The contract proceeds to settlement on the agreed date. 5) The 48-hour clause The 48-hour clause is often placed in a contract where a subject to finance clause is present. It means that if the seller has a contract on their property with buyer A, but receives another offer that they would like to accept, for example an unconditional offer from buyer B, buyer A has 48 hours to come up with the finance or buyer B gets the property. 6) Chattels Chattels are the items within the property that are removable, for example, the stove, fridge, and window dressings. Every contract should clearly identify what is included in the sale and what the seller will be taking with them. 7) Put it or get it in writingAs a buyer, when you decide to make an official offer on a property, it must be made in writing.No offer should ever be presented to a seller verbally. A seller should never accept a verbal offer.An offer is only official once it has been put in writing and it doesn’t become a contract until it has been signed by the person selling the property.8) Settlement Settlement is when ownership of the property officially and legally changes hands. At settlement, the funds are made available by the buyer and transferred to the sellers account. Generally the buyers lawyer meets with the sellers lawyer to transfer the documents of ownership and keys. Settlement takes only a few minutes, but the period of time between signing the contract and settlement taking place can vary greatly.A standard settlement period is 6 weeks, but the buyer and seller can negotiate a longer or shorter settlement in the contract terms. 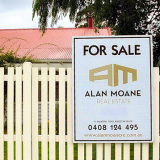 About the AuthorAlan Moane is the Director of Alan Moane Real Estate, a Tasmanian real estate agency. Alan has more than 20 years experience and has sold over 1000 properties. Alan has extensive experience in residential and commercial sales, property management and property development.